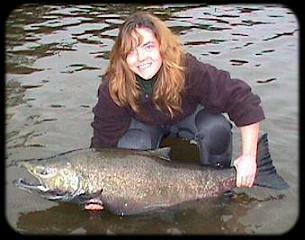 - Visit the Forums Section for lots of discussion by anglers of Pacific Northwest fishing! Please Visit One of the Companies Helping to Bring You the Resource Center! Low, clear water .. some of the toughest conditions in which to entice strikes from wary steelhead (summer or winter-run) and salmon (especially those seeming non-biting low water fall variety). Here's a neat tip that can often help coax these seemingly lock-jawed steelhead and salmon into biting. The name of the game here is spinners ... not just any old spinner, but size 2, 3, and 4 brass vibrax spinners that I'll tell you how to modify. Blackened spinners can help entice extreme low water fish to bite like this 50 lb. class king that Fishgal caught & released on the Quillayute River. 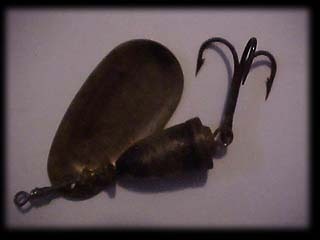 You must use a brass vibrax ... the other brass spinners from Mepps, LJ, Pen(Mor)-Tac, etc. don't seem to accept this treatment very well. Get yourself a lit candle, a pair of pliers, and a glass of water filled nearly to the top. Now, with the pliers, barely grab hold of the tip of the spinner blade furthest from the clevis and hold the blade perpendicularly (come on remember your HS geometry) approximately two inches above the tip of the candle flame. You will notice that in a few seconds that the blade tries to take on a tarnished color (with a prism-like effect much like an oil sheen on water). Continue holding the blade until it turns a dark brown with this sheen, then place the blade in the glass of water to cool it off. Do not hold the blade too close to or in the candle flame ... the carbon from the flame will deposit on the blade and turn it completely black and you will not be able to reverse this process!! If you happen to turn some black ... these work quite well too, but this is not the objective of this tip!! Once the blade has the darker color, repeat the process to the body of the spinner by holding the eye that attaches to the hook. You will have to spin the body of the spinner to achieve the effect all the way around! Presto, that's it for the modification ... looks pretty cool, huh? Well, the fish seem to think so too!! You will probably mess a few up and turn them completely black ... save these spinners for the very brightest of days ... they work quite well! For the ones that turn out right, you'll know if they seem to have that oily sheen, use these in the morning or late afternoon in fast water. Cast nearly straight out and use almost no retrieve until the spinner has swung into the shallowest water near the bank below you. You're trying to quarter the spinner across the stream just above the bottom ... Hold on Tight!! I use the different sizes based on how well the spinner gets down...start with a number 3. If it seems to hang up a lot, switch to the smaller number 2. If it doesn't tick bottom, try casting just a hair further upstream and / or switch to the size four. Remember a cardinal rule of spinner fishing ... the faster the water, the slower the retrieve. Do fish the fast water!! Yes, even what some anglers might consider to be rapids. This is where the active fish will be! Remember these areas have a higher oxygen content than slower areas. Steelhead and salmon both need this extra oxygen to stay active when the water gets warm this time year!